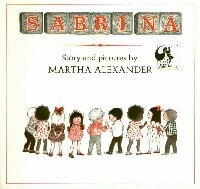 (1920- ) Martha Alexander has written and illustrated a host of books for children with a fanciful soft touch that reminds many of the precarious and magical world of childhood. She lives in Hawaii. These are charming books featuring Alexander's soft pencil and watercolor illustrations and quirky sense of humor that remembers both the delights and frustrations of childhood. It doesn't surprise me that kids respond to them or that grown-ups remember them in that nostalgic. warm place in their hearts. Alexander's first book was published in 1966, and she's still writing! And My Mean Old Mother Will Be Sorry, Blackboard Bear. Dial Press, 1973. 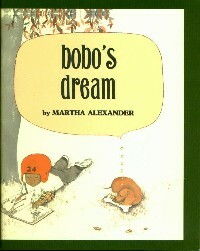 Bobo's Dream. Dial Press, 1970. The Candlewick Book of Bedtime Stories. 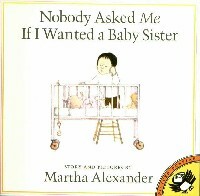 (with Camila Ashforth) Candlewick Press, 1995. Even That Moose Won't Listen to Me! Dial Press, 1988. Four Bears in a Box. Dial Press, 1980. Goodnight, Lily. Candlewick Press, 1993. How My Library Grew By Dinah. H.W. Wilson, 1983. I Sure Am Glad to See You, Blackboard Bear. Dial Press, 1973. 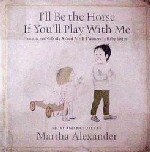 I'll Be the Horse If You'll Play With Me. Dial Press, 1975. I'll Protect You From the Jungle Beasts. Dial Press, 1973. Lily and Willy. Candlewick Press, 1993. Board book. Maggie's Moon. Dial Press, 1969. The Magic Hat. Puffin Books, 1994. The Magic Picture. Puffin Books, 1994. Marty McGee's Space Lab No Girls Allowed. Dial Press, 1981. Maybe a Monster. Dial Press, 1968. Move Over, Twerp. Dial Press, 1981. My Outrageous Friend Charlie. Dial Press, 1989. No Ducks in Our Bathtub. Dial Press, 1973. Nobody Asked Me If I Wanted a Baby Sister. Dial Press, 1971. Out! Out! Out! Dial Press, 1973. Pigs Say Oink, a First Book of Sounds. Random House, 1978. Poems & Prayers for the Very Young. Random House, 1973. The Story Grandmother Told. Dial Press, 1969. We Never Get To Do Anything. Dial Press, 1970. We're in Big Trouble, Blackboard Bear. Dial Press, 1980. When The New Baby Comes, I'm Moving Out. Dial Press, 1979. Where Does the Sky End, Grandpa? Harcourt Brace Jovanovich, 1992. Where's Willy? Candlewick Press, 1993. Willy's Boot. Candlewick Press, 1993. You're a Genius, Blackboard Bear. Candlewick Press, 1995. Canfield, Dorothy. Understood Betsy. Holt Rinehart and Winston  1972 printing. Ehrlich, Amy. The Everyday Train. Dial Press, 1977. Hobart, Lois. What is a Whispery Secret? Parents Magazine Press, 1968. Johnson, Laverne. Night Noises. Parents Magazine Press, 1968. *Kaye, Buddy, Fred Wise, and Sidney Lippman. A You're Adorable. Candlewick Press, 1998. Board Book. Kennedy, Mary. Come and See Me. Harper & Row, 1966. Lexau, Joan M. Emily And The Klunky Baby And The Next-door Dog. Dial Press, 1972. Malloy, Judy. Bad Thad. Dutton, 1980. *McGrath, Barbara Barbieri. The Little Green Witch. 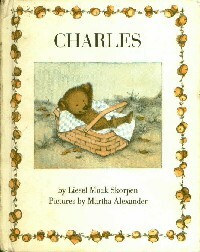 Charlesburg Publishing, 2005. Orgel, Doris. Whose Turtle? World Pub., 1968. Scism, Carol K. The Wizard of Walnut Street. Dial Press, 1973. Scott, Jane. To Keep An Island. Atheneum, 1983. Skorpen, Liesel Moak. Charles. Harper & Row, 1971. Skorpen, Liesel Moak. Elizabeth. Harper & Row, 1970. Skorpen, Liesel Moak. Mandy's Grandmother. Harper & Row, 1975. Untermeyer, Louis. Forget-Me-Not. Golden Press, 1970. Untermeyer, Louis. You. Golden Press, 1969. Udry, Janice May. Mary Ann's Mud Day. Harper & Row, 1967. Van Leeuwen, Jan. Too Hot For Ice Cream. Dial Press, 1974. Williams, Barbara. Jeremy Isn't Hungry. E.P. Dutton, 1978. Wyse, Lois. Grandfathers Are to Love. Parents Magazine Press, 1967. Wyse, Lois. Grandmothers Are to Love. Parents Magazine Press, 1967. *Zolotow, Charlotte. Big Sister and Little Sister. Harper & Row, 1966.